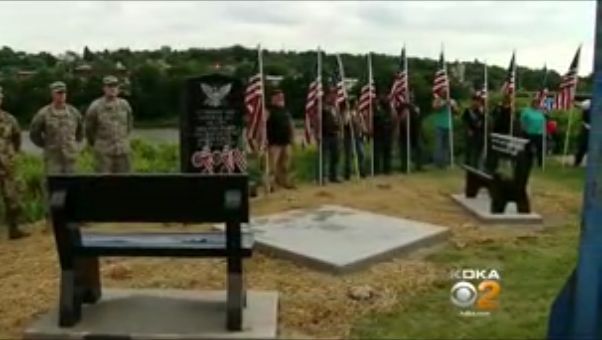 OIL CITY, Pa. — The Oil City Veterans of Foreign Wars (VFW) held a public rededication ceremony outside its facility on Monday after a bench featuring a God-centered quote from Pennsylvania’s founder was given back to the organization as city leaders voted to remove the display from a public park due to a complaint from a professing atheist organization. A crowd gathered along the banks of the Allegheny River to witness the occasion, which was heralded by patriotic music and speeches. A motorcycle guard, decked with American flags, also lined the streets to accompany the bench to the VFW property. “The problem we’re solving today is the effect of the negative influence of persons who demand respect for their beliefs, but are not willing to do so toward others,” lamented State Rep. James Lee, R-Seneca, according to video footage from KDKA-TV. As previously reported, American Atheists (AA) sent a letter last November to the mayor of Oil City to request that the bench, which was donated in 2003 by the VFW, be removed from Justus Park. It assert that the inscribed text violates the U.S. Constitution. “Men who aren’t governed by God, will be governed by tyrants,” the bench reads, paraphrasing a quote that is often attributed to Pennsylvania founder William Penn, a Quaker who wrote a number of theological books and who once stood trial for “causing a tumult” in preaching in the streets. AA contended that the quote violates the Establishment Clause of the U.S. Constitution, which instructs that “Congress shall make no law respecting an establishment of religion.” The group also said the text is disrespectful to non-Christians. “[T]he Tyrants Bench contains an overtly religious message which endorses one particular religious viewpoint: Christianity. The statement that ‘Men who aren’t governed by God will be governed by tyrants’ not only has absolutely nothing to do with honoring our service members, but is derisive toward the all non-Christian American service members who have served and died for this country,” its letter asserted. Although local residents pushed back against AA, launching a “Save the Bench” campaign and pledging over $17,000 should the city face a legal challenge, city council members voted in April to return the bench to the VFW in order to avoid the expense of a lawsuit. The VFW had requested that if the display was removed, that its other non-religious bench and memorial be returned as well. Therefore, all of its monuments were returned and were present for Monday’s rededication ceremony. Some of those present said that the government should never have caved to AA. 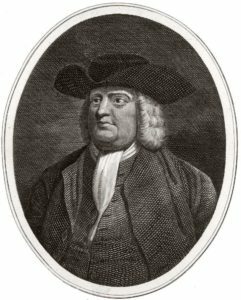 As previously reported, Pennsylvania Founder William Penn was also the author of the 1682 “Great Law,” which was a series of civil and criminal statutes based upon the fear and reverence of the Lord. “And be it further enacted by the authority aforesaid for the better prevention of corrupt communication that whosoever shall speak loosely and profanely of Almighty God, Christ Jesus, the Holy Spirit or the Scriptures of truth, and is legally convicted thereof, shall for every such offence pay five shillings or suffer five days imprisonment in the house of correction at hard labour to the behoof of the public and be fed with bread and water only during that time,” one of the laws read.